The Chrysanthemum Throne is the oldest existing dynasty. There is still much affection for the symbol of the nation, but young people know less and less about its history. Tokyo (AsiaNews) - The 20th anniversary of the enthronement of Emperor Akihito on the Chrysanthemum Throne (12 November 1990), was an occasion to review the regency of this dynasty, which has survived the recent decades of violence and miseries of war and economic renaissance. A measure the popularity of the emperor was visible in the tens of thousands of Japanese from all across the nation who travelled to the imperial palace November 12th to sign registers placed at its entrance to express their congratulations. A solemn audience at the National Theater of Tokyo and a folklore evening in the vast Imperial Palace Plaza were the culminating events of the day’s celebrations. 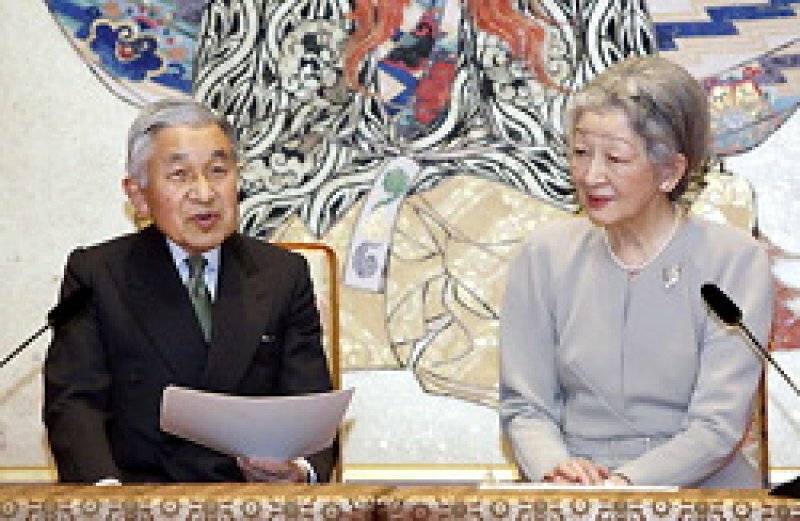 The first, chaired by Prime Minister Yukio Hatoyama, was reserved for representatives of the nation, the diplomatic corps and groups of sufferers, for whom the emperor and Empress Michiko paid continuous attention. The second, festive, was listed as "private" because it hosted, on strict invitation, 30,000 guests (!) representing the various spheres of national life and culture. The obvious artificiality of the document and the coldness of legal language have not shaken the feeling of respect and, dare we say, affection of the Japanese toward those who represent it as the supreme symbol. This is because the people have read the word "symbol" in cultural rather than legal terms. And here culture has value. The "Chrysanthemum throne" is the world's oldest hereditary monarchy. According to traditional counting, the current Emperor occupies the 125th place in an unbroken dynastic line, which according to legend, is traced to Emperor Jimmu in 660 BC. Mythology aside, the historical record attests to its existence at least since the fifth century AD. After expressing his congratulations as representative of the nation, Hatoyama said: "Basing myself on the thoughts of the emperor, today I commit myself once again so that the Japan may win back the confidence of the peoples of foreign nations as we reflect on the history of the past and I will do my best to promote world peace and the welfare of mankind". The emperor is known for his caution in avoiding arguments that could have political implications, but this time in response to the congratulations of the Prime Minister, he openly alluded to the history of the monarchy and to the sufferings of the people. The long reign of his father, which lasted 63 years (1926-1989) had been turbulent in the first part, until 1945, and prosperous in the second. If the Emperor Hirohito can hardly be absolved of all responsibility for the fierce militarism of the 30s and 40s, his moral commitment to support the people in the post-war redeems it. In response to the speech of Prime Minister, Emperor Akihito also expressed hope that the (historical) legacy of his father is not misunderstood or forgotten by future generations, "The reign of my father, he said, started at a very difficult time: he was reluctant about the events that led to war .... What worries me most is that the history of the past is being gradually forgotten. Today, three out of four Japanese were born after the war”. The two decades of the reign of Emperor Akihito have been difficult: a long period of economic stagnation and natural disasters. But, paradoxically, difficult situations have allowed him to draw even closer to the people, he has visited all the provinces of the country and during natural disasters he visited the evacuation centres. Empress Michiko has always accompanied him. "The emperor and empress, writes a columnist in Asahi, were always eager to offer a word of consolation and sympathy to those who are in distress. Their presence has proved a huge relief and encouragement to ordinary people afflicted by the current severe economic situation". Akihito is not afraid to face the sad historical legacy of the Showa era (his father) In his speech he said: "Over three million Japanese war dead were foreign and many lives were lost. We can not forget that Japan today is built on the many sacrifices of the past". He visited Hiroshima, Nagasaki, Okinawa, and several Pacific islands to express respect for the victims of war, both Japanese and foreign. Together they have carried out 15 state visits, especially to Asian nations: among them also China where in a diplomatic speech he also expressed regret for past conduct of Japan. "One can not deny, writes the Asahi, the diplomatic activities of the emperor and other members of the imperial family have greatly contributed to promoting international goodwill and reconciliation". In this area only one shortcoming remains: the Korean peninsula. Hopefully it will soon be remedied.